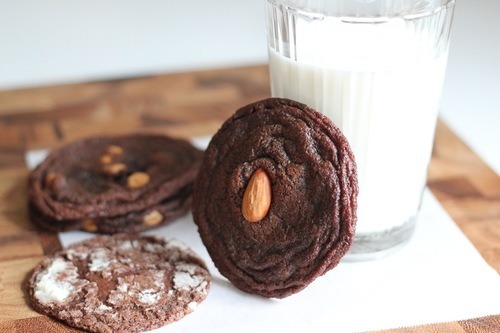 My whole house is filled with the irresistible aroma of buttery semi-sweet chocolate cookies baking! Ahhhh…wonderful, sweet, delicious chocolate! Why do you tempt me so????? The amazing thing about chocolate is that it can actually be very healthy. We will save this conversation for another day, another post! Today I have whipped up 3 different cookies using one fabulous cookie dough. Chocolate Crinkles, Almond Joy Cookies and Reeses Peanut Butter Chip Cookies. The creative options don’t end here. Wrap this dough around rolos, snickers minis, add M&Ms, butterscotch morsels or press it into a pie plate for a deep dark and chewy crust for cream pies and cheesecake! 5 oz bittersweet or semisweet chocolate, chopped and slowly melted in microwave on low or in stainless steel bowl over pan of nearly simmering water. Set aside. Cover and store in fridge at least 2 hours or as long as overnight. Preheat oven to 375 degrees and spray 2 cookie sheets with Pam. For crinkles, roll 1 inch balls in powdered sugar and onto cookie sheet 2 inches apart. Bake for 8 minutes. For cookies with chips in them same instructions apply, just omit powdered sugar. For cookie with a candy bar center, flatten same amount of dough as above into a disk and wrap around candy and into a ball. Same instructions apply as above. For Almond Joys, I cut each little bar into thirds and pressed a plain almond into the center right out of the oven.